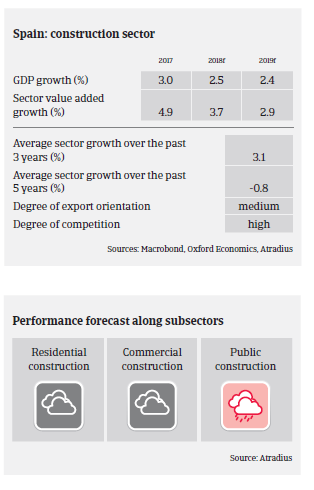 The construction sector continued its rebound with an estimated value added growth rate of 3.7% in 2018, mainly due to Spain´s economic recovery and increased foreign investments. However, it must be said that the current construction recovery comes from a very low level, following years of severe recession. In 2019, value added construction growth is expected to increase by about 3%, mainly driven by residential and commercial construction. Residential building benefits from a rebound of the real estate market, driven by lower interest rates and higher employment. In the commerical building segment demand from retail and hotel & catering is driven by the entry of new investors (e.g. real estate investment trusts, investment funds) searching for alternative returns to variable and fixed rent investments. Growth in the public construction/civil engineering segment is expected to remain subdued due to the ongoing commitment to fiscal deficit reduction. While conditions for external financing have continued to improve in 2018 due to the robust performance of the domestic economy, high leverage still remains a serious issue for many Spanish construction businesses. Moreover, both commodity and labour costs are increasing. The contruction sector has a record of frequent and long payment delays. While the average payment period has improved in recent years it continues to be high, at 95 days on average. Late payments by mainly larger companies continues to negatively affect the working capital management of many smaller businesses in all segments, including the construction materials subsector. Despite this, insolvencies are not expected to increase sharply in 2019. Due to the ongoing rebound, our underwriting stance for the construction sector has become less restrictive than in previous years, with an open stance for larger businesses and international groups. That said, any significant increase of interest rates for loans would again lead to a tighter underwriting stance. We are still prudent with smaller businesses (especially newly established ones), as the market has not yet fully consolidated, many companies are still highly indebted, commodity prices have increased and lending conditions have not yet fully eased. We are also more cautious when underwriting businesses dependent on the public construction sector, as the activity level in civil works remains low.